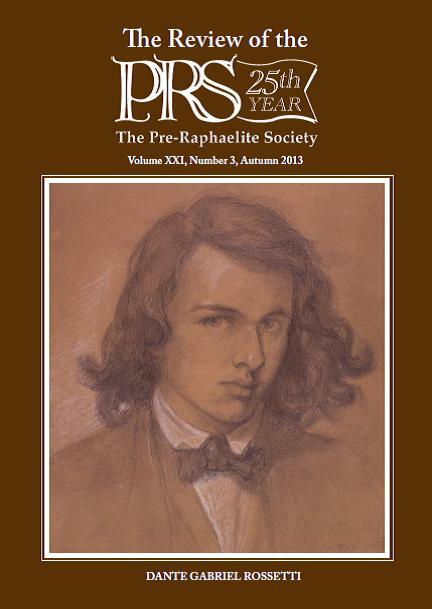 Publication of Souvenir Issue of the PRS Review to celebrate 25 years of the Pre-Raphaelite Society – “Dante Gabriel Rossetti”. We are delighted to see the recent publication of our latest special edition of The Review, and with many colour illustrations, it contains six essays devoted to Dante Gabriel Rossetti plus a poem by Sarah Doyle. Our Editor, Serena Trowbridge, invited our seven contributors to look at Rossetti’s art, poetry and life, considering different aspects of each. This has resulted in an excellent collection of varied and interesting essays, with full colour images and at 76 pages, it is a superb tribute to one of the founding members of the PRB. See The Review section for essay and author details. Copies can be purchased at a cost of £5, including P&P for UK orders – please email the Treasurer using info@pre-raphaelitesociety.org for further details. 1. “Rossetti’s Women in the Victorian Novel” by Sophia Andres. 2. “Rossetti and the Spirit World” by J. B. Bullen. 3. “The Replication of Dante Gabriel Rossetti’s Beata Beatrix – Demand and Desire” by Margaretta S. Frederick. 4. “Suffer and be Still: A New Look at Rossetti’s Menagerie” by Jo George. 5. “Dante Gabriel Rossetti and Science” by John Holmes. 6. “Rossetti’s Obsession” by Jan Marsh. 7. “On Viewing Rossetti’s Self-Portrait” by Sarah Doyle. Just read it cover to cover! Great! Well done! Glad you like it! I’m very pleased with it.